Styrofoam cups are convenient because they are cheap and light weight, but Styrofoam cups can have a negative impact on the environment. When most people refer to “Styrofoam” they mean the single use plastic that is white and holds food and beverages. This is a mistake because "Styrofoam” refers to a more durable, blue insulation material trademarked by Dow Chemical. However, in order to make the article easy to understand, we will use the word “Styrofoam” throughout. Below we highlight two illustrations of the environmental impact of Styrofoam cups as well as two examples of progress that have been made to help the environment. 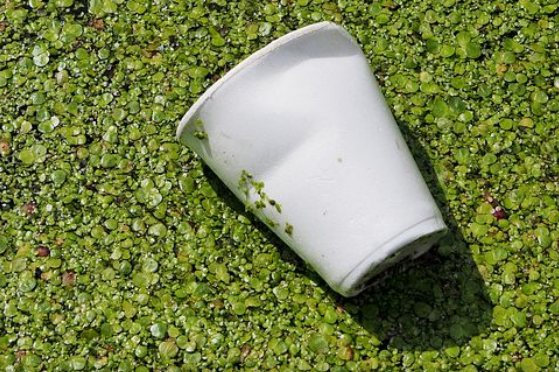 Americans reportedly throw away 25 billion Styrofoam cups every year. Styrofoam cups are non-biodegradable. Instead of breaking down completely overtime, Styrofoam cups break into tiny pieces and stay in the environment for hundreds of years. This harmful substance is difficult to clean up. Styrofoam escapes waste collection systems and accumulates on land and in water because it is easily windblown. 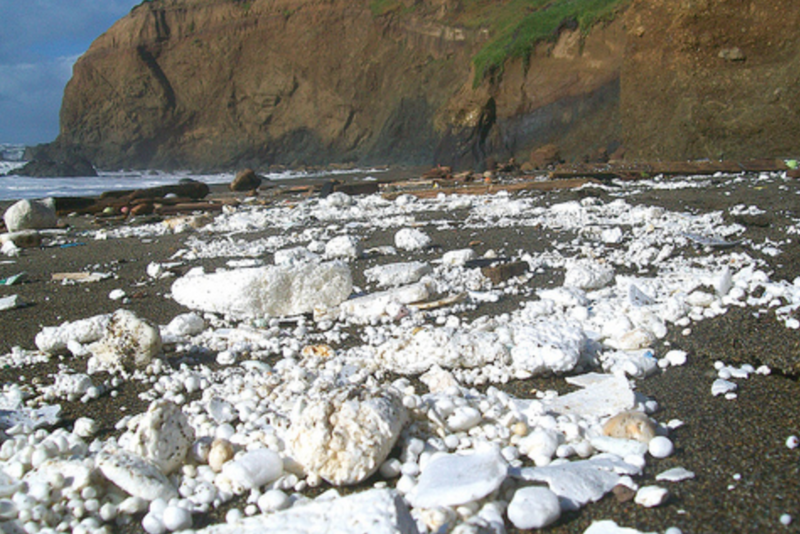 Pieces of Styrofoam show up in our parks, forests, beaches, oceans and rivers. The San Diego Chapter of the Surfrider Foundation claims that its volunteers collected 12,575 pieces of Styrofoam from their beaches in 2017. The amount of single use plastic littered on our planet’s land and water is staggering. Pollution caused by Styrofoam is not only unpleasant to look at but it is also harmful to our planet’s animal life. Animals often mistake Styrofoam as food and ingest it. This causes harm or death due to starvation, choking or chemical buildup in the digestive system. The United Nations Environment program notes that this has a ripple effect. When animals ingest this harmful substance they are not able to complete their natural functions. This disturbs the ecosystem and impacts the health of the ecological community. The negative impact comes back to humans as well because there is nothing preventing us from eating marine life that has been exposed to Styrofoam. 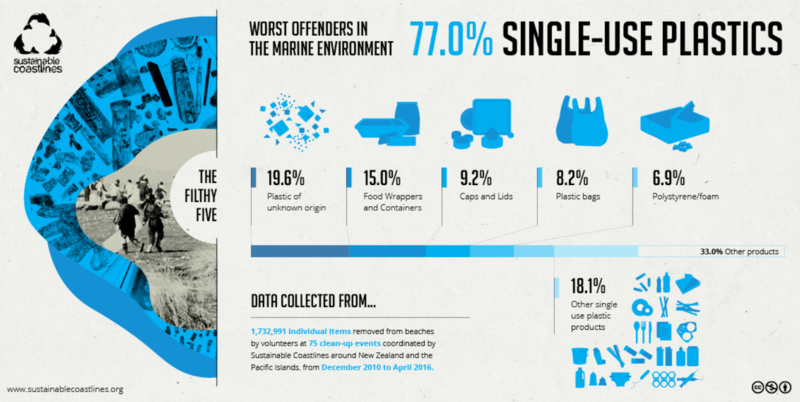 The infographic below from Sustainable Coastlines provides data on the debris that has the biggest impact on our marine life. The manufacturing of Styrofoam cups used to have a negative impact on the ozone layer. Most Styrofoam cup manufacturers have now updated their processes in order to reduce the depletion of the ozone layer. The ozone layer is important because it protects the earth from the ultraviolet radiation produced by the sun. It allows us to enjoy the outdoors while being protected from harmful rays. Styrofoam cups start off as small beads that are filled with air. They are then heated and molded into the shape of a cup. Manufacturers use a substance called a blowing agent that allows the beads to expand. It used to be common to use substances that depleted the ozone layer as they decompose. These substances have been phased out and replaced with substances that do not deplete the ozone layer. This has removed one harmful effect of Styrofoam cups. Some communities feel that the only way to completely stop the environmental impacts of Styrofoam cups is to ban them completely. Styrofoam cup bans have been passed at the state and city level. New York City's ban on Styrofoam containers went into effect on January 1, 2019 after a lawsuit prevented the ban from passing for about six years. However, not all states and municipalities have been able to pass bans. For instance, a 2018 proposal to ban Styrofoam cups in Hawaii was rejected by lawmakers despite support from the public. Opponents of the ban cited increased costs to consumers and small restaurants because recyclable or biodegradable food containers can be more expensive. This is a widely debated topic as some parties feel a ban is necessary and would immediately reduce litter. Other parties disagree and say that there is little evidence to prove that bans have helped the environment. Progress has been made by restaurants on an individual level. Some restaurants have realized the negative impacts of Styrofoam and have stopped using them. Consumers have also persuaded restaurants to ban Styrofoam. For instance, a surfer in Hawaii, John John Florence, recently convinced a popular restaurant to replace their single use Styrofoam cups with compostable cups. The restaurant agreed and it is estimated that this one decision will keep around 48,000 Styrofoam cups out of Hawaii. More and more restaurants in Hawaii are following suit. This eco-friendly philosophy has the ability to increase brand awareness and attract new customers. Individual consumers and business owners can work toward diminishing the environmental impact of Styrofoam cups on their own.